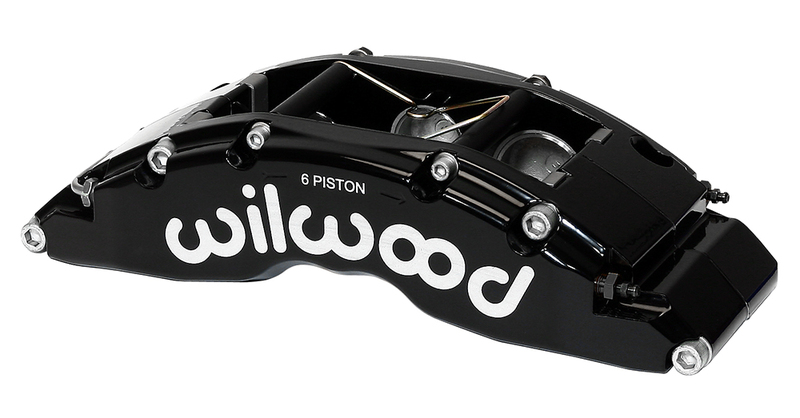 The TC 6R Radial Mount Caliper represents a complete new generation of refinement in Big Brake Technology from Wilwood. Six stainless pistons captured within a massive high strength forged aluminum body generate the stopping power and durability to stylishly handle the heavy loads of custom late model trucks and sport utility vehicles. TC 6R calipers are stress flow forged from premium grade, billet aluminum alloy blanks. FEA structural analysis technology was employed to develop a design that minimizes weight, and maximizes rigidity against deflection. The expanded bridge radius easily accommodates 1.38" thick rotors up to a full 16 inches in diameter. The bodies are joined and reinforced through the bridge with six high strength coated steel alloy bolts. Cross bridge bolts add strength against deflection and body separation at high pressures and heavy loads. 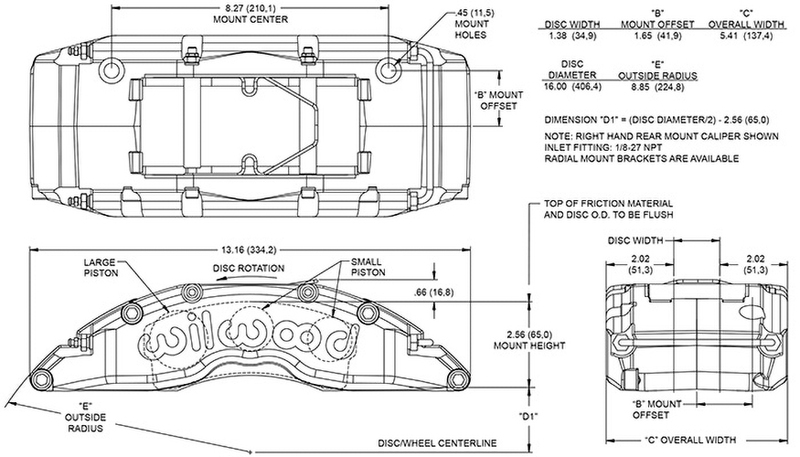 Steel insert plates protect the bridges against wear and gouging from the load bearing edges of the brake pads. The TC 6R, starting at 8.66 pounds, generates unmatched pad clamping efficiency through six thick walled stainless steel pistons. Heavier piston walls add a measure of strength against deflection or distortion in heavy load conditions. Stainless steel is used to resist corrosion and reduce the heat being transferred from the pads into the caliper body, seals, and fluid. The differential piston bore design is taken from Wilwood racing caliper technology. Clamping pressure is proportionately distributed to provide balanced pad loading with even wear properties at all loads and temperatures. The piston bore volumes are configured for matched compatibility with the output capacities of the OE master cylinder and power boost systems. The total TC 6R package is capped off with rubber dampened fluid transfer tubes, recessed two-piece bleed screws, and bridge mounted pad-dampening springs. Pad dampening springs reduce vibration, road rattle, and many of the engagement harmonics that can cause squeal or other harsh brake noise. Choices of either a signature high luster anodized Wilwood black, or a special multi-process gloss red coating, enhance the pure stopping power of the TC 6R with high tech style and a total custom look inside the wheels. Radial mount adapter brackets are used in Wilwood brake kits to provide a secure and precise method of attaching the TC 6R caliper to the factory mount bosses on the original spindle.